When you live within the 5 boroughs, Moishe’s Storage facilties Brooklyn offer free pick up services! If you’re a new customer committing to a 3-month storage rental with us, up to a 5×10’ space, Moishe’s offers you the services of our experienced NYC movers free. Why waste your time and effort renting a truck when our team of relocation experts will do the work for you, at no extra cost? Our team of highly trained movers are experts at handling your large, bulky furniture items through narrow hallways and down staircases. What started with Moishe Mana’s “man with a van” Manhattan moving service in the 1980s has quickly grown into NYC’s largest storage provider. We are the city’s premium storage provider. All our self storage units near me come with climate control, as do all our moving trucks. We specialize in fine wine and fine art storage for restaurants, museums and private collectors. We at Moishe’s promise to preserve your products and keep your furniture items in the same condition you trusted them to us in. That’s part of our 100% customer satisfaction guarantee to you. 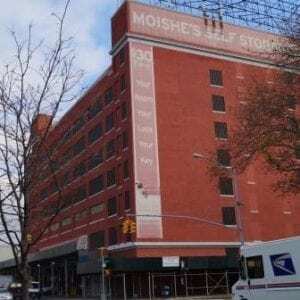 If you are seeking furniture storage facilities Brooklyn with free pick up services, look no further than Moishe’s. Call (800) 536-6564 to schedule your free pick up today. Our relocation experts will drive one of our climate-controlled trucks to your location, pick up, transport and store your belongings for you, for free! We utilize state-of-the-art burglar alarms, security checkpoints, motion detectors and the latest in fire suppression technology. What other storage facilities Brooklyn will offer this, besides Moishe’s? Feel free to schedule a consultation with one of our account managers today. We will be happy to help you estimate the size storage space you’ll need. With over 20 different unit sizes, you’re sure to find the perfect fit for all your personal or commercial storage needs with Moishe’s.